Bryant Park Blog: Parlez vous Français? Español? Nippon? Italiano? Parlez vous Français? Español? Nippon? Italiano? 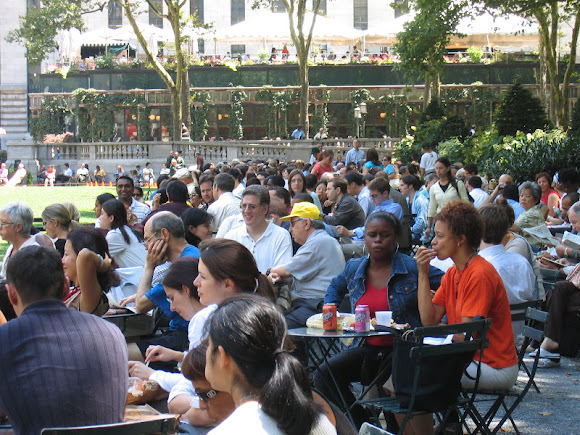 ... about Bryant Park's new series of free language classes. This summer, we've partnered with inlingua to offer beginner lessons in French, Spanish, Japanese and Italian, as well as intermediate lessons in French and Spanish. Each month will offer one beginner lesson in each of the four languages on a rotating Monday schedule. Intermediate lessons will alternate each Wednesday between Spanish and French. Keep in mind that though there are four sessions of each beginner language class, the beginner classes are geared towards true newbies, and each beginner class of a particular language will have the exact same structure and lesson. Intermediate classes are meant to be more conversational with different themes. New vocabulary will be covered each week, and the outcomes will be different for the intermediate students because of their varying capabilities. Sign up now and get ready to parlez, hablar, Hanasu koto, or parlare this summer with inlingua in the park.